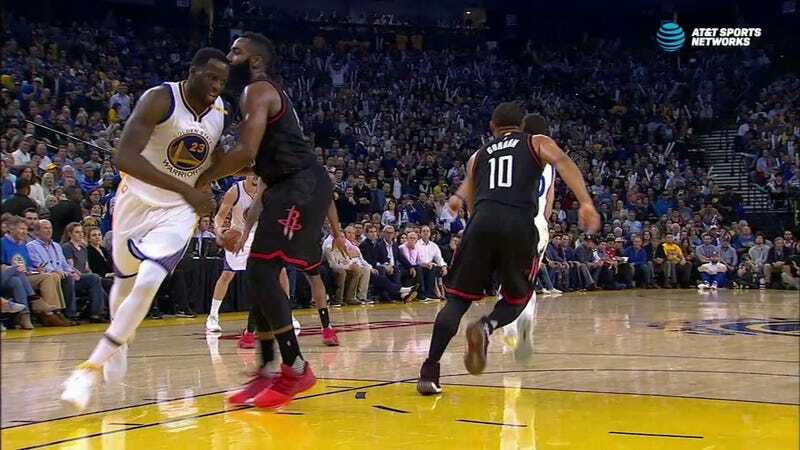 Draymond Green Tries To Explain Foul Of James Harden: "He Pinched Me, So I Punched His Wrist"
On its face, it seems like a pretty weak excuse for punching the sore wrist of an opponent, in that it’s hard to imagine a player like Harden consistently and sneakily engaging in the incredibly juvenile behavior of pinching. But a slow-motion replay shows what looks like it might actually in fact be a decently hard pinch on the chest! Harden has been nursing a weak left wrist since jamming it in a game a few weeks ago, and Green was handed an offensive foul. He told the San Jose Mercury-News after the Warriors’ win that pinching isn’t something he experiences often: “Guys aren’t going around pinching people.” Except, apparently, in this case.